I’ve mentioned Box in passing here before, but I figured it was a good time to introduce him properly. 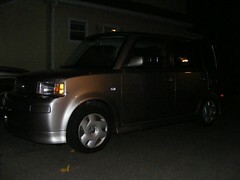 Box is a 2004 Scion xB I bought back in November of 2007. 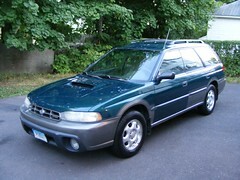 I had gotten bored with the ’96 Subaru Outback I had at the time and sold it. I was planning to replace it with something around $3K that got excellent gas mileage. I thought playing with hypermiling would be interesting and I was sharing a house with friends who owned a minivan & pickup so a wagon seemed less vital. 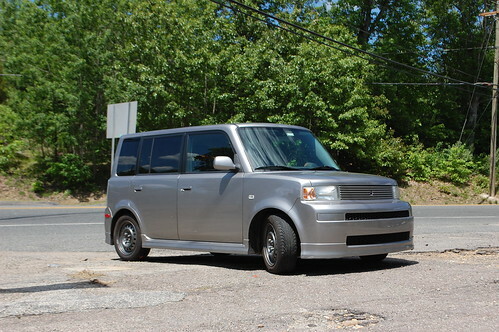 After looking at a variety of Civic hatchbacks & Neons without any luck, I found an ad for a used car lot selling an xB for $8500, a pretty good price for the car. My girlfriend and I drove about three hours out to see it on a whim. Despite having 92K miles on it, it drove like a brand new car, had a surprising amount of pep for a 108hp motor and had a flat out ridiculous amount of space inside. The inside smelled a bit of cigar smoke though, and there was a small scrape on the passenger doors. On a whim I offered the guy $6500. When he asked how I’d gotten to that figure I told him it was what I felt like paying for the car. About then we got back from the test drive, at which point he went in the office and dug out a piece of paper and handed it to me, telling me he would sell it to me for that figure. It was the invoice from the auction he’d bought it at, for $6828. 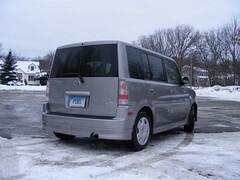 After a desperate drive to the nearest branch of my bank 30 miles away, I was the proud owner of a 2004 Scion xB, for $6823, because his secretary wrote the invoice wrong, and I didn’t catch it until we’d left. I drove home waffling wildly between maniacal glee and absolute “What have I done?! ?” terror. The picture to the right is actually the first one I took, right after I pulled in the driveway. Next part; I can’t leave well enough alone, some of the (many) modifications I’ve made. 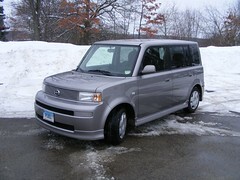 This entry was posted in 2004 Scion xB "Box", Car shopping and tagged 2004, car shopping, scion, xb by Pixel. Bookmark the permalink.